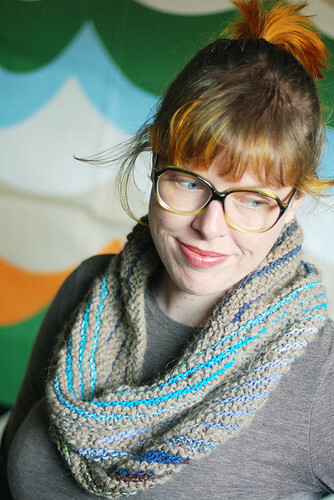 Hey Portland people, and everyone traveling to Portland for this weekend’s Rose City Yarn Crawl, I want to let you know I’ll be making a few appearances throughout the weekend and I’m excited to be a part of this whole thing! Yeah! Besides having some patterns in the prize basket mix, I’ll be having trunk show events at both Twisted and Wynona Studios! First, on Thursday afternoon 12:30-2:30 at Twisted, I’ll be part of a co-trunk-show with my good buddy and designer extraordinaire Star Athena! 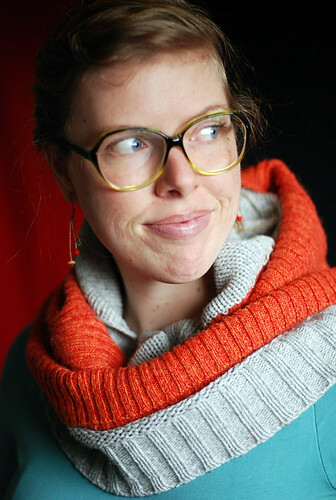 I’ll have with me lots of assorted leethal knits pattern samples, and I’ll be there to answer questions, explain how my crazy things are constructed, talk about anything you want, etc, yay! And then, on Saturday 4-7 I’ll be back at Wynona for the official Remixed trunk show event! So I’ll be hanging out, available for questions, to explain pattern stuff, talk about my use of recycled yarns, etc… I hope you can make it to one or more of these events!! And for all of you lovely readers, I want to show you a peek at what I’ve been working on lately! If you follow me on twitter/tumblr/instagram you’ll have seen some peeks at the next design in the leethal Short Stripes Trio – Barry! I’m now finishing up the final sample, with yet another variation, and I’m hoping to release the pattern 1 week from today, if all goes well. I won’t talk about it in detail here, but here you can see a few of the different options and how it’s super versatile, like Maurice. 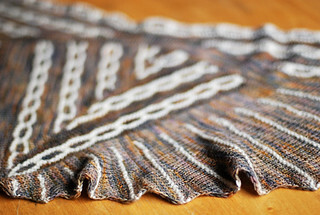 If you love what you see here, you’ll automatically receive this pattern the moment it’s released if you get the whole Trio (on ravelry here), which will include Maurice right now, and Robin will be the final pattern in the future. 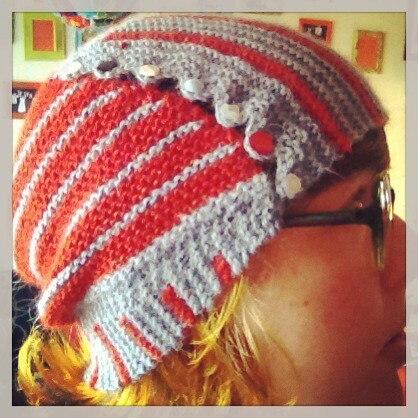 All stripy short-rows accessory patterns. Yum! 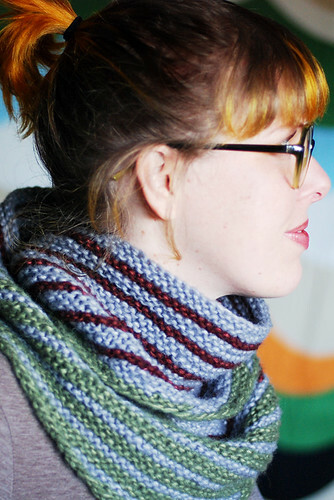 We’re doing a Short Stripes Trio knit-a-long over in the leethal ravelry group (which has just surpassed 800 members, woo! 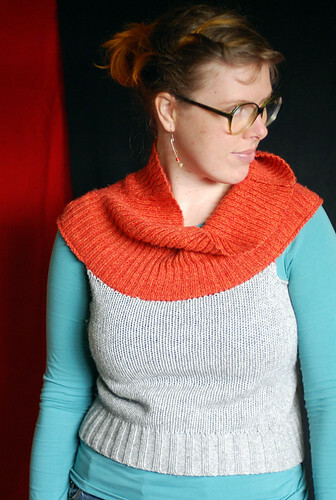 ), working on Maurice now – you can come and go at any time, post photos of patterns from the trio as you make them, and we can all knit short rows and stripes together, fun times! Some beautiful Maurices are being made! And with that, I will leave you to get back to my work on Barry! 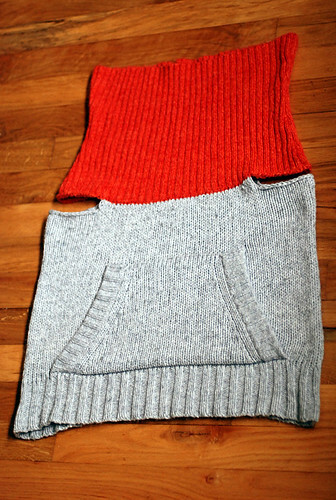 Convertible cowly sweater vest made from recycled sweaters! I made a thing! 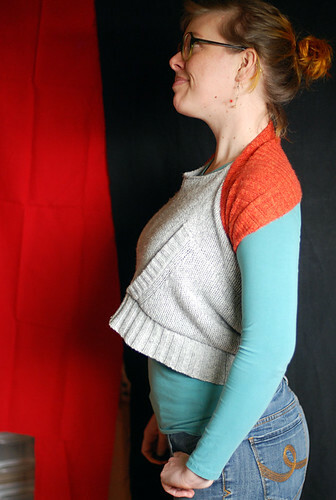 My now-functioning studio made me itchy to make stuff, so the other day when I should have been working at the computer all day, instead I did a little digging through my reclaimed sweater stash, and made this! What is “this”? 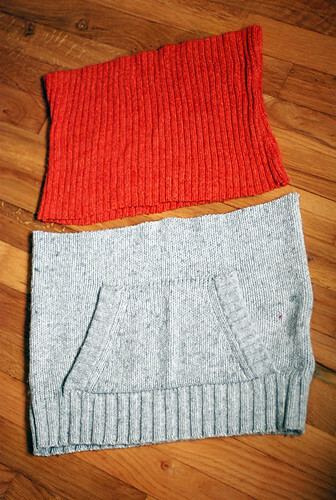 It’s a convertible cowl-neck sweater vest slash cowl slash shirt slash skirt…..? 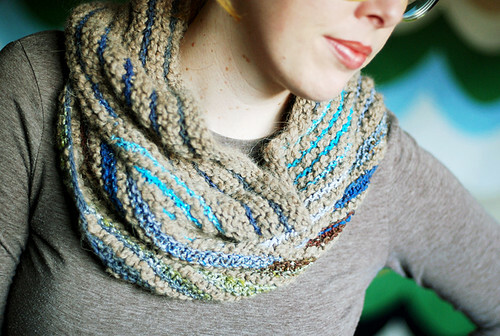 It’s a simple concept that I came across on pinterest/ravelry and have been eager to try out ever since! First, to give credit… that pin which first introduced me to the idea had no source (the original wrong source led me to the pattern-less rav project page which helped me reverse engineer the shape; I’ve since edited the pin source and description), so I did some reverse google image searching and found that the pin image is a garment by Elementum, and can be seen in this video (4:40 minutes in). Also, one of the sweaters I had in my recycling stash had a kangaroo pocket, which I thought would make the garment even more awesome, right?! Well, sort of; it also makes it less versatile. 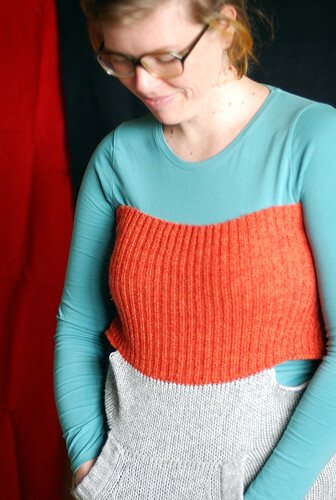 So, don’t necessarily follow my every move with this tutorial – if you want the most convertible, comfy finished result, then go for big sweaters with no pockets. 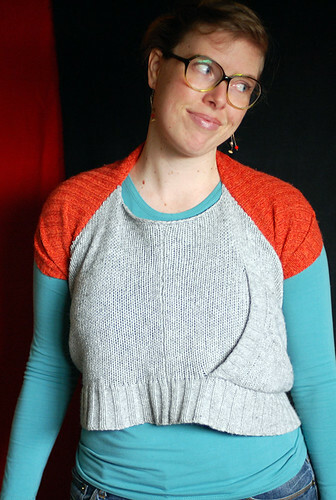 If you like mine exactly as it is, find a fitted sweater with a kangaroo pocket and you’re good to go! 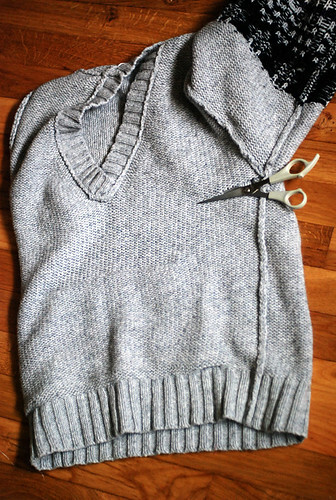 Your two sweaters should be as close as possible to the same width – if one is a bit bigger than the other, then the slightly bigger one can just have slightly bigger arm-hole parts, not a big deal. But the closer in width, the better. 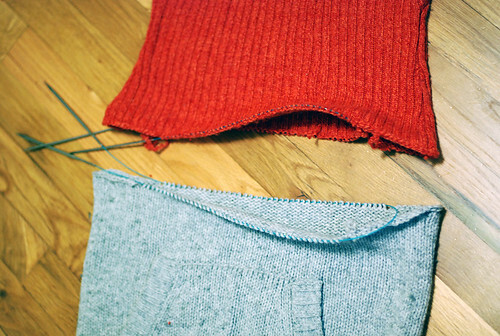 As for gauge / stitch count – if you have two sweaters in the same gauge, the same width, for the same (or extremely close to the same) stitch counts, excellent! This would take some serious thrift store luck to happen though. 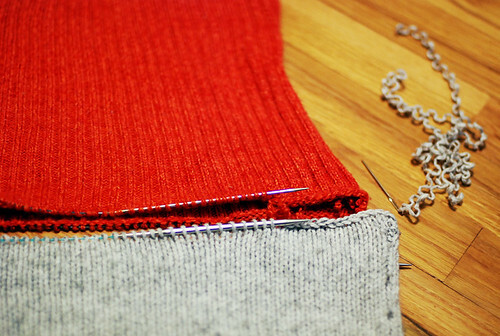 Probably, the two sweaters you use will be different gauges, for different stitch counts. 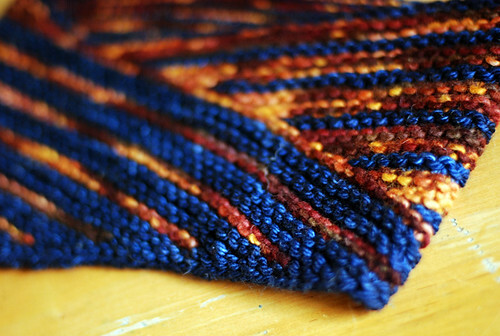 You’ll just need to do a little math to work decreases around the smaller gauge one so that they end up with similar stitch counts, it won’t be too hard. 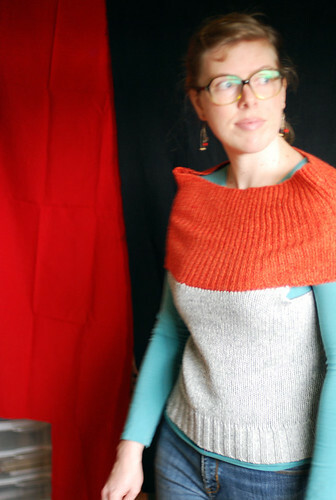 A couple last notes – if you’re not a knitter, you can do this project without any knitting, by sewing everything together instead. It won’t be as neat, but it will work. 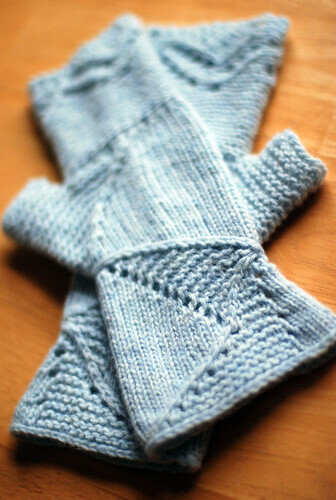 Stitch around the armholes carefully so no stitches unravel, and sew the edges together (instead of grafting) securely, so everything stays together and nothing unravels. 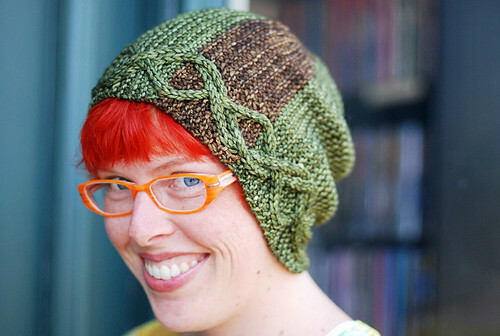 If you are a knitter, and you’d prefer to just straight up knit this entire thing, that should be easy enough! You can see the shape here, a big tube with two big holes. Go for it! 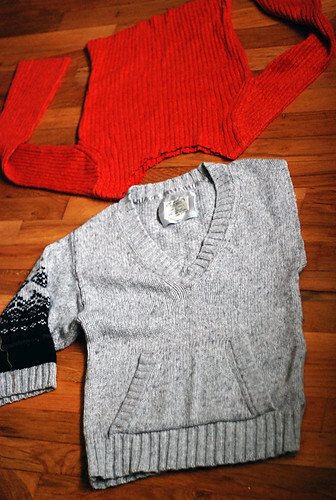 Lastly, if you feel guilty using perfectly good sweaters for craft materials, then look at thrift stores for sweaters with stains or holes… flawed old used clothing at a thrift store is unlikely to be bought and appreciated by normal (read: non-crafty) shoppers, and if you craft with it, you’ll be giving it a brand new life! Crafting with reclaimed materials from thrift stores is a win-win for everybody, the way I see it! It’s not like there aren’t plenty of clothes still remaining on the racks for shoppers in need of cheap duds. 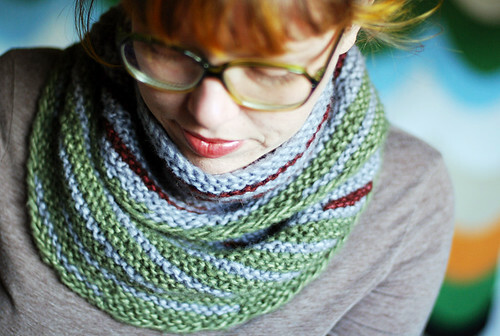 For each tube, stretch it out, to loosen up the stitches, then unravel the top 1 or 2 rows. You’ll end up with a pile of little yarn bits, as a result of cutting across, and the top row may have been snipped into accidentally. 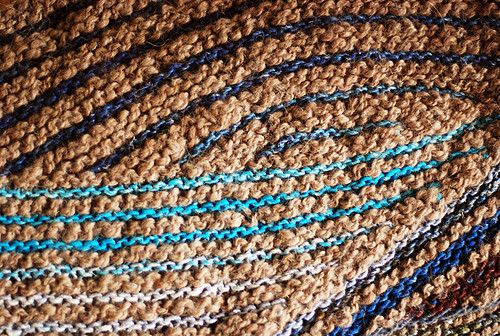 I find it’s easier to get the stitches onto the needle if I unravel 2 rows – those little yarn bits tend to stick in there when you rip out the first row, then they generally fall out with the second row. Once you’ve unraveled a row or two, and are left with a clean line of live stitches, slip all those stitches onto your circular needle. 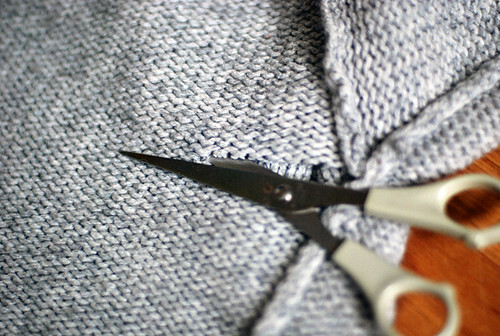 Be careful to pick up all stitches in the seam area so they don’t end up unraveling later – you’ll probably need to do some extra snipping or fiddling around to get every stitch on the needle. If you end up taking out part of the seam stitching, that’s fine, as you can re-seam it up when you’re weaving in all your ends. 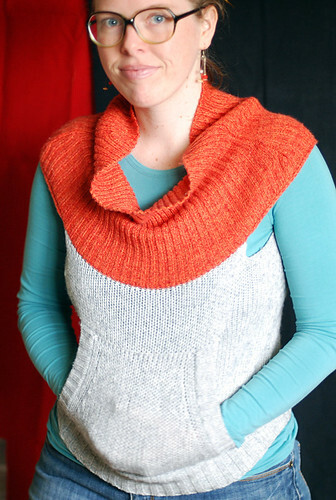 Hold on to the yarn strands that you unravel, as you’ll use them to finish the armholes and graft. 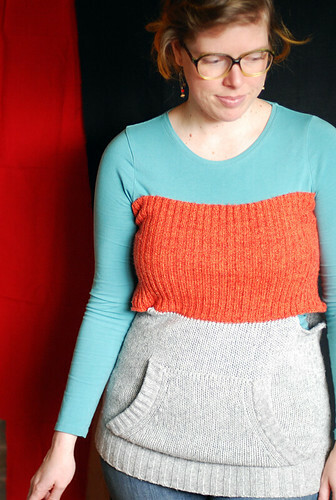 You can also rip out a couple rows worth of yarn bits from the unused part of the sweater, if you need extra yarn. 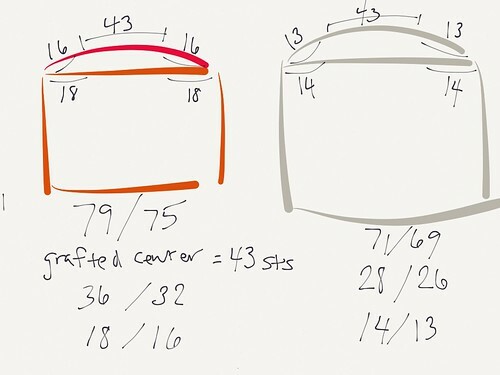 Here’s when you’ll have to deal with stitch counts and gauge issues… I didn’t take photos of this part for my project, and it’ll probably be different for you anyway, so you’ll just have to figure it out for yourself with your particular sweaters. 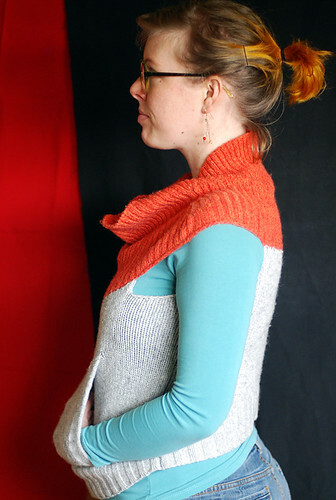 My fine-gauge orange ribbed sweater happened to be almost exactly twice as many stitches as the chunky grey sweater, making the math easy for me – I doubled up the yarn (held 2 strands together) and knit around, decreasing all stitches, for one row around the orange sweater, k2tog every stitch. 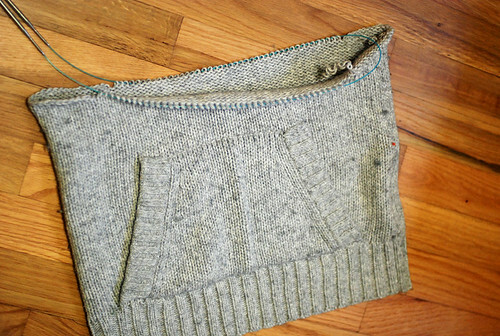 It was 2×2 rib, so I k2tog the 2 knits, then k2tog the 2 purls. 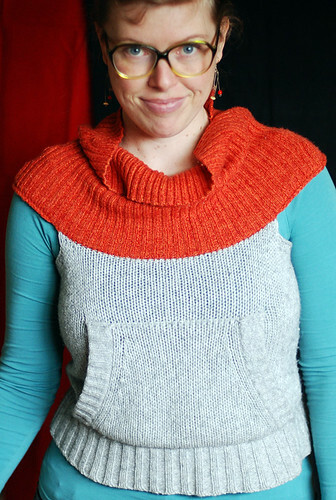 I could have k2tog the knits and p2tog the purls, but since I knew it would be grafted in stockinette, I just knit all the decreases. I did this at a loose tension, so it wouldn’t pull in. If you don’t luck out with such as even ratio of stitches to decrease, decrease evenly around one tube as needed to give your two tubes close to the same stitch count. Count all the stitches across, from seam to seam. 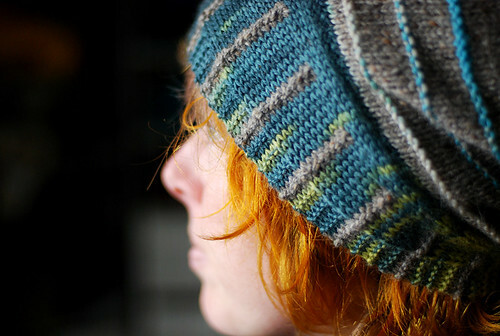 Usually the stitch count will be slightly different on one side from the other – write everything down. My notes as I worked are shown below. 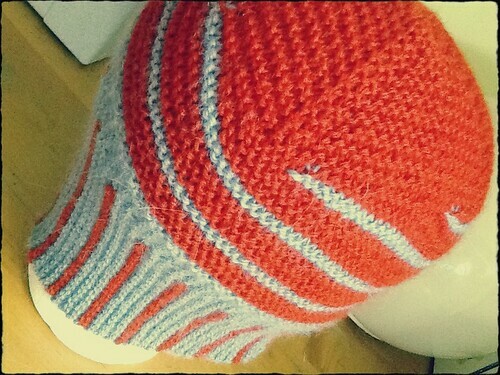 My orange tube had 79 stitches on one side, 75 on the other; my grey tube had 71 stitches on one side, 69 on the other. 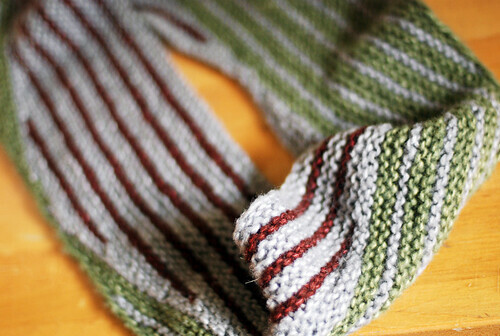 Determine how many stitches will be joined – the stitches not in the armholes. In the above sketch, this is x (x is the same on all sides of both tubes). 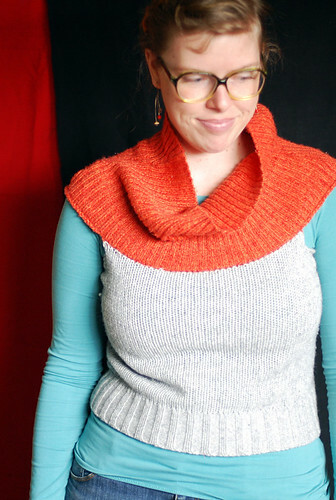 This measurement depends on your total tube width, but it should be somewhere around the width across (when laying flat) minus 11 inches or so (armholes)… or somewhere near 2/3 of the total width. 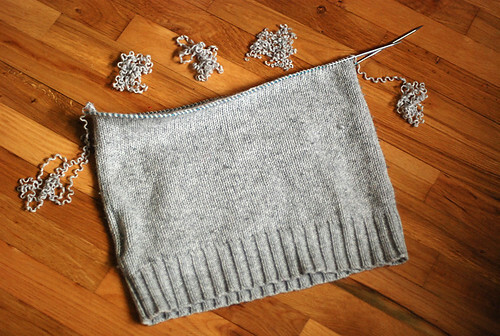 If your stitch counts for each side are all odd, choose an odd number, if they’re all even, choose an even number; if they are different, then you’ll need to adjust by having slightly different armhole bind-off stitch counts as needed. 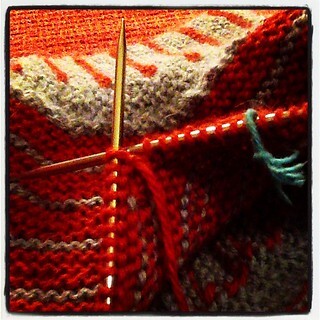 I decided my joined stitches would be 43 stitches (odd number). Now, for each side (4 sides total – 2 tubes, 2 sides each tube), subtract the joining stitch count from the total stitch count, and then divide each of these numbers in half. (You can see in my notes, 79 minus 43 is 36, in half is 18; 75 minus 43 is 32, in half is 16, and so on.) 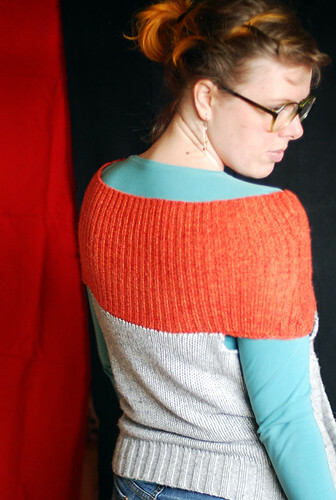 These numbers are your bind-off stitch counts for each side of the armholes. 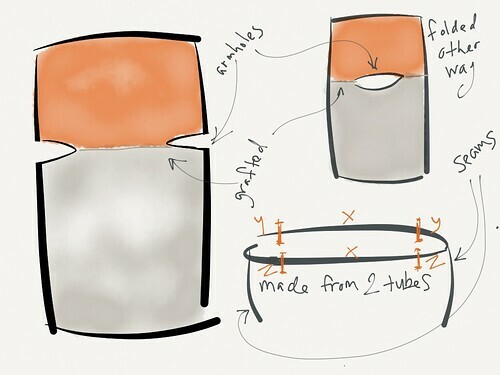 If you like algebra, then using the labeled sketch above, you need to find y and z values for each tube (different for the 2 tubes). x is your joining number (which you just decided) – so, total stitch count on the y side, minus x, divided by 2, is each y; total stitch count on the z side, minus x, divided by 2, is each z. y + z is the total armhole length (for the one tube – the y+z numbers for the two different tubes added together makes total armhole circumference stitch count). 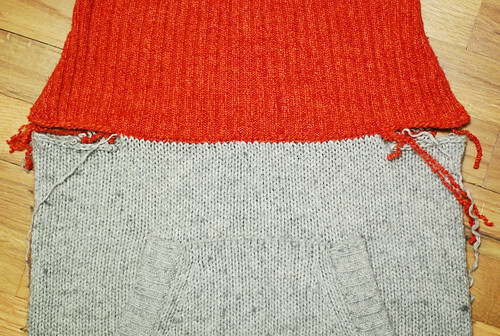 Knit across all armhole stitches – so, knit to seam, then knit correct number of stitches on other side of seam. 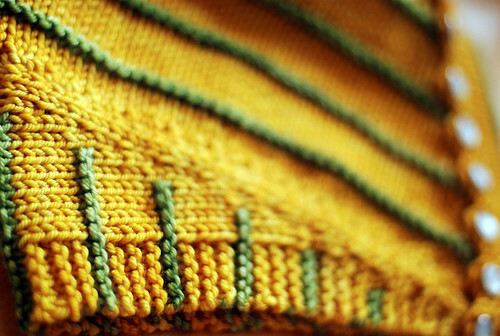 (For mine, if I slipped 16 stitches, then I knit across those 16, then I’d continue knitting 18 on the other side of the seam. 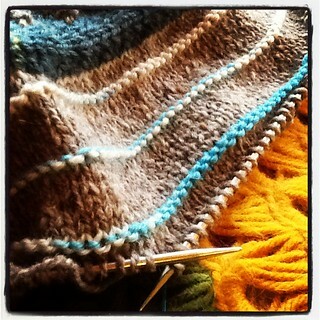 Using the variables, if you slipped y, then knit the y, now knit z.) 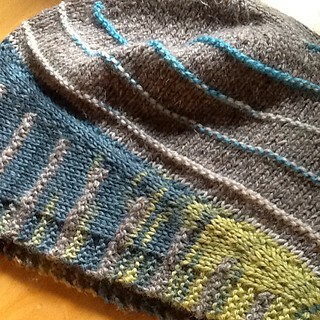 Now bind off those just-knit stitches, loosely, purlwise – I recommend the decrease bind-off method. *Purl 2 together, pass just-purled stitch back onto left-hand needle without twisting it, repeat from *. 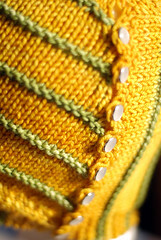 All you need to do now is graft those live stitches together, for a nice, clean join! If your tubes’ sides each had different stitch counts from each other, join the two sides which had higher stitch counts, and the two sides which had lower stitch counts. 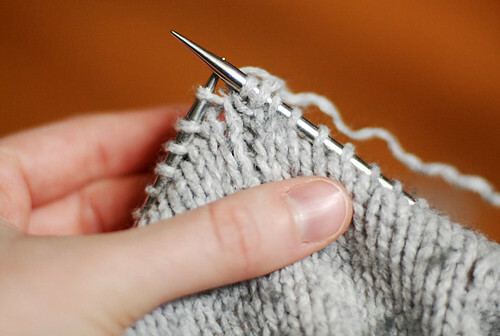 Hold the 2 rows of live stitches together, needles parallel, wrong sides facing, and thread some of the extra yarn (whichever is the more sturdy, less breakable yarn of the two) onto a blunt yarn needle – try to use a length of yarn at least 4 times as long as the line of stitches. Head over to my (brand new!) 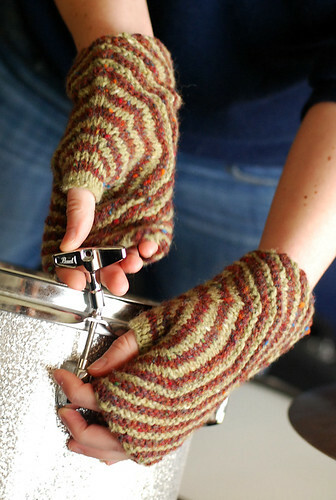 full step-by-step photo tutorial in my leethalknits.com knitting tutorials for grafting instructions. 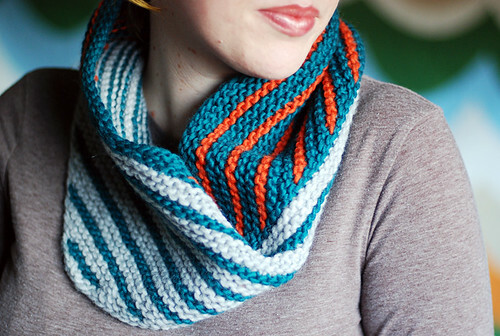 I love it as a cowl! 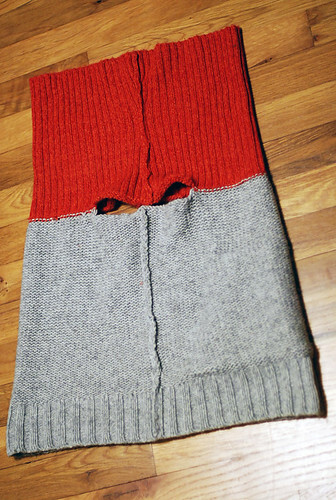 …and as a weird tube sweater thing, haha. I had fun playing around with the different ways. 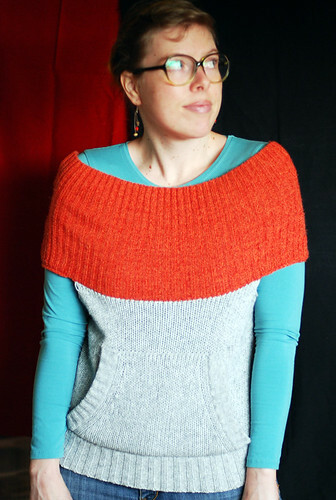 Anyway, conclusion on my end, try again with bigger sweaters and no pockets, and it should be awesomesauce. If you use the tutorial to make your own, I’d love to see it! 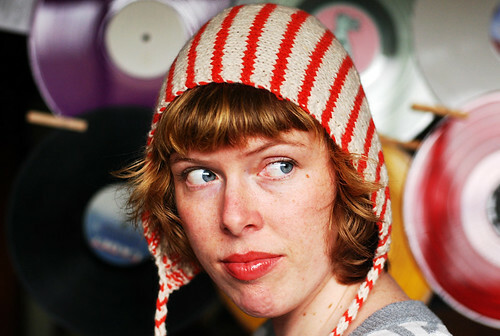 I have this flickr group that I tend to forget about, but you can stick a photo in there to share! Happy crafting!! 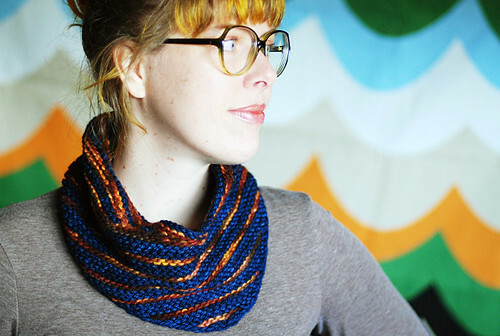 New pattern: Maurice! A third of the Short Stripes Trio! This idea developed when I started brainstorming about a design concept that I wanted to play with in different ways, but not let one single design get too out of control complex, like I can tend to do sometimes. I wanted to try to steer myself to design slightly more simple patterns, so I figured if I planned three different designs around one idea, then I could really explore that idea, taking it in three different directions. Three seemed like the perfect number, enough room to play around, but not too many designs so that I’d get bored with the idea by the end. I’m loving the trio concept so far. 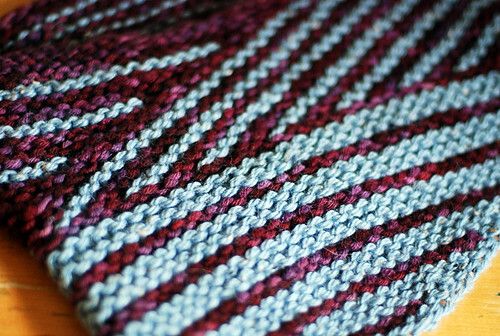 I actually first started on a completely different trio, when the concept originated, which is still in the works, but then I got sidetracked by wanting to play with short rows and stripes, and the leethal Short Stripes Trio was the first to actually come to be! 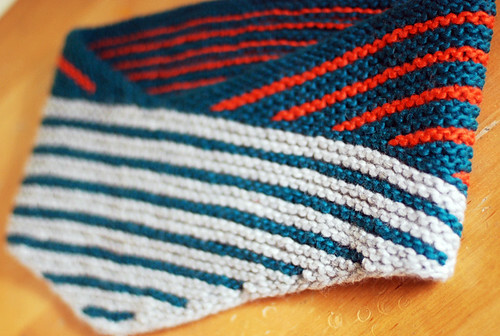 So, there will eventually be three accessory patterns, for three different objects, each featuring short rows and stripes. There will be some overlap with techniques and themes, but the three designs will definitely stand out on their own… and chances are, if you like this first one, you’ll like all three! And yeah, with the naming, “trio”, get it? I’ve done way too much brainstorming about future trio pattern names! 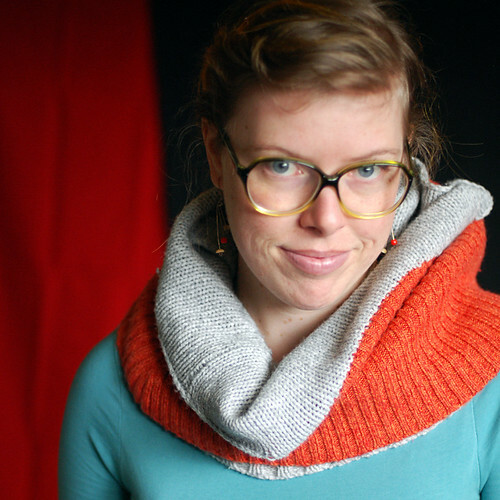 Moving on to Maurice specifically… as you’ve been seeing, it’s a cowl that can be made in three different versions – narrow, wide, and long loop. All the versions can be small, medium, or large, and there are lots of detailed modification notes for making any size you want in any gauge you want. 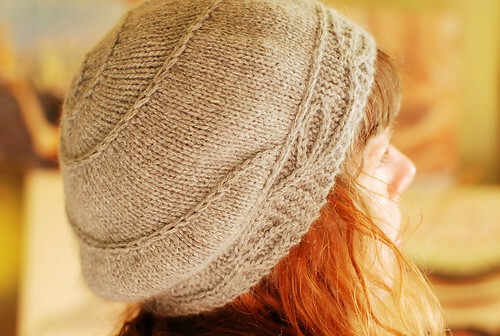 The pattern is written for a recommended gauge of aran weight yarn at 3.25 sts/inch, but you can use the mods to use any yarn you want! The striping pattern is designed to stripe between two colors in each section, and you can stick to the same two colors for the whole thing, or switch to new contrasting colors for each section. 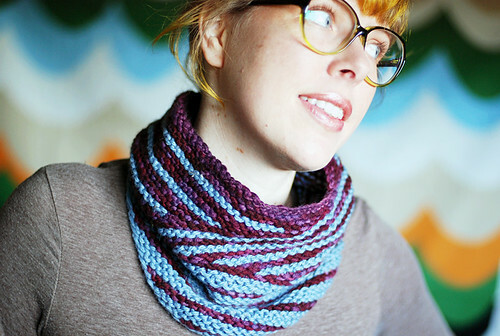 The narrow cowl and long loop versions have two (symmetrical) sections, and the wide cowl has three (asymmetrical) sections. There are also modification notes for working with colors in different ways, if you want to really do your own thing! 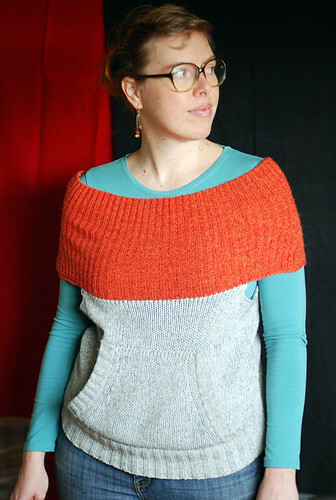 I made samples of the narrow version in small and medium, the wide version in small and large, and the long loop in small; a bunch of awesome test knitters made a wide variety of different versions, several with modifications, so check out the rav projects to see those! Thank you so much, my fantastic testers!! 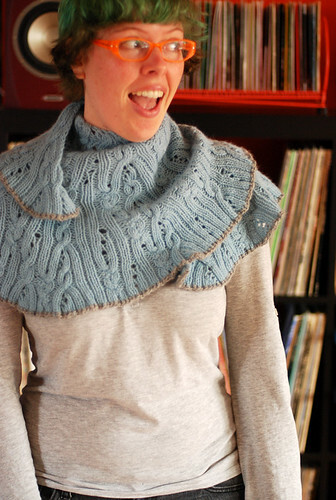 That’s about all I can think of to say about Maurice… the yardage estimates and other details are all listed on the pattern page. 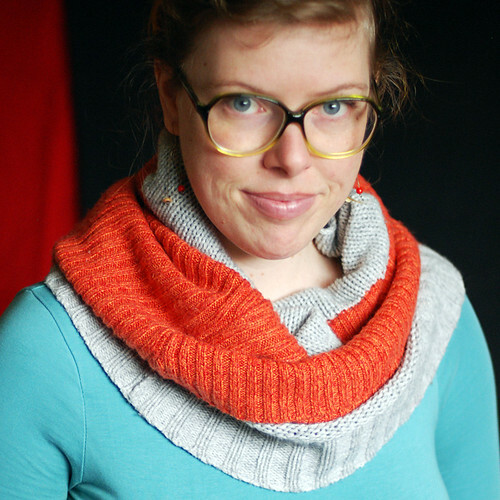 I’m currently working on the second trio pattern and I’m really excited about it – I should be to the point where I can start showing you sneak peeks (on twitter, instagram, tumblr) within a couple days!